Greetings one and all fellow Gooners, it’s been a while since we last spoke. Much has gone on in recent months with the club on and off the field and it’s been an interesting few months this side of the Atlantic in N5. The pain of Sp**s at home was washed away with 12 hours in the pub and a drunken bet being made by me revolving around The Arsenal. I quit my job the day of the Wigan Carling Cup game and celebrated embarking on being paid to sit at home through December by getting monumentally drunk post-game with the usual match day suspects here. There’s not a lot to say...4400 Gooners travelled, Brett didn’t make it (but TMG’s Kurtis Powers did) due to the weather unfortunately, nearly the whole team changed and I drove a grand total of 450 miles round trip, or about 8.5 hours, to miss both of our goals....how? Some days just don’t go your way...I am going back to Wigan to see a win as I was there for last years 2 nil up to 3-2 down shambles as well. This was more like it. Despite the monstrous new years hangover, from drinking far too much on the River Thames leading up to midnight, Brett and I travelled to England’s second city with it all going our way in the end thankfully. Plus, we made it out alive despite the locals penchant for invading their own pitch, tearing bits of it off and throwing it at away fans which was nice. The riot police vans outside the away end were slightly worrying though! Brett has covered this game already but I think both of us will remember one brave teenage girl swearing at us in the away end while we were 3-0 up only for about 2000 traveling Gooners (including Brett and I) to mercilessly hit back with (to the tune of “are you Tottenham in disguise?”) “Does your mother know you’re here? Doooooes your mother know you’re here?”...it’s good to win away and there really is nothing else like singing Sami’s song whilst going absolutely mad in another club's stadium. 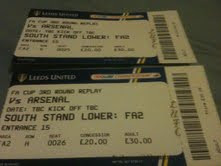 This was painful, this was back to no fun at all and feeling distinctly in the minority fan group in a ground. During my month out of work I’d somehow convinced a friend it would be a good idea to make a trip to Ipswich on a random Wednesday night. At the back of a garden shed acting as a football stand we watched as the game unfolded. The fact that we had been chanting “You sleep with your sister” at the home fans to the tune of Eboue’s song no doubt bought footballing karma down on us...but when you’re in the countryside you have to wind up the locals somehow. One word to describe this...Police! There were police out in force at the station platform after our Arsenal-organised train ride up from London arrived. There were police trying to usher us onto buses to the stadium, there were police everywhere. This is what can change so much depending where you go for away games (and will be contrasted with the next away game) and you have to watch out for. The North / South divide in the UK is massive, and in Leeds for some locals it means a lot. 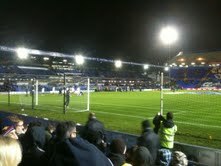 There was the normal vitriol inside the ground but afterwards I have never been in such an intimidating atmosphere. The bus back to the train station was protected by two police riot vans, on arriving at the station those fans emptied all officers on board for form a corridor into the station. Inside the station we were all penned into a corner while home fans were pushed away from us. Our train home eventually had to be brought into the platform in front of us as we could see Leeds fans waiting for us on the bridge over the platforms we would have to walk over. Then walking down the platform the police control was evident as Leeds fans tried to charge through the ticket barriers and the police to reach us. We made it onto the train but I didn’t realise that football could be so potentially damaging to your health. This was a personal best. Never had Andy (my mate coming to the game with me) or I been further for a competitive game. The day in front of us was an 8.30am train from London to Newcastle, arrive 11.45am, meet a friend on his stag/bachelor weekend then game and home after...with a lot of pub in between then back to London for 10pm making 7 hours of train rides in one day. Now, what happened at the game has been documented on this blog already. I can’t begin to describe the ridiculous highs of the first half (I texted Brett 9 mins in to check we were really 3 nil up as we were so high in the stands) and then the lows of seeing it fall apart in the second half. This game was all about faith. Faith in your team that whatever could happen on the day. Faith that a favourable result was possible for your team. 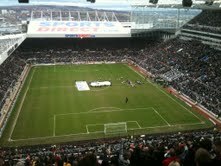 If you can ever make an away game make Newcastle your first target. You will never meet a more welcoming group of true football fans. After the issues in Leeds this was welcoming place with a group of fans who were just happy to talk football and minimal police...plus the locals don’t like Sp**s fans either. This was epitomised by two guys, father and son, who we met in the pub pre-game. Both born and bred Geordies, take a look at their shirts below. The son still lived in the city but his father travelled 140 miles south from Scotland for every game. They had seen their team get beat numerous times, they had seen their team get relegated from the Premiership but they were still proud to say they were supporters of the’ Toon’. We shared a good few beers with them, talked about each others teams and the game in general. I think this is what we have a problem with at home days, a certain malaise sets in..an expectation from some fans that they can turn up, be entertained with winning football and not have to do anything to help the team in return. When you go away you have to be heard, you have to stand up and be counted. It brings out the true supporter in you. I was lucky enough to be at the Barca home match last week, the atmosphere was electric as all the fans knew we had to be heard to make things happen. Yet I sit here finishing this blog after Stoke when the same old flat atmosphere prevailed. For those that have not made an away game yet I implore you...go. 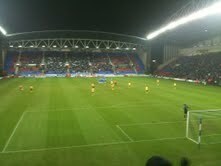 Arsenal fans travel in large numbers...over 4000 at Wigan, just under 4000 at Birmingham, 4500 at Ipswich too. You’re part of a strong collective who want to be heard, who want to show their colours and want to support their team vocally. My next game will not be a home game, or an away game...it’s off to a neutral ground called Wembley....hopefully a very special blog entry to follow. Keep the Faith Gooners, Arsene always knows.